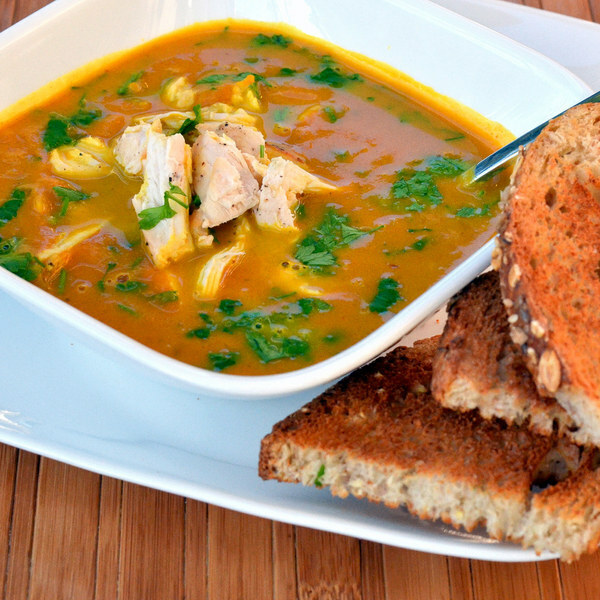 ← Curried Coconut Pumpkin Soup with Chicken & Crusty Bread. Heat a medium saucepan over medium heat. Peel and mince onion and garlic. Coat bottom of saucepan with oil. Add onion and, stirring frequently, cook until softened, 4-5 minutes. Add garlic and cook until fragrant, 15-30 seconds. Add pumpkin, broth, curry powder, turmeric, and salt. Stir until well combined and cook for 2-3 minutes. Add coconut milk and stir to combine. Simmer until rest of the meal is ready. Slice chicken in half horizontally to form thin fillets. Season with salt and pepper. Coat bottom of skillet with oil. Add chicken and cook until cooked through, 2-3 minutes per side. Shred chicken with your hands or cut into bite-sized pieces. To serve, pour soup in a bowl, garnish with chicken and parsley, and have crusty bread on the side. Enjoy!